Head coach Gatland joked “I hope we didn’t disappoint too many people” in the wake of the Lions’ punishing victory in Christchurch that adds a new level of intrigue to the three-Test series against New Zealand. All Blacks boss Steve Hansen criticised the Lions’ difficult schedule and their commercial responsibilities, while England coach Eddie Jones claimed the tourists would lose the Test series if they play like Gatland’s Wales. Gatland had been left fuming at the unwelcome outside critiques that only increased after Wednesday’s 22-16 loss to the Blues - but used victory over the Crusaders as a stick with which to beat his detractors. “It’s been a tough week, it’s been a really tough week; there’s been a lot of criticism,” said Gatland. “People have written the tour off already after two games. “And that’s been challenging. It’s been challenging to all of us. “We’ve had to stay strong within the group, keep the faith and remember that the goal is the Test matches, and keep improving for that. Runaway leaders the Crusaders boast 14 consecutive wins in Super Rugby, averaging 37 points a match - but the Lions drilled Scott Robertson’s side into submission in a potent showing in Canterbury. The three-Test series against back-to-back world champions New Zealand starts on June 24, and this Crusaders clash had been dubbed the unofficial fourth Test. The Lions came through with flying colours, silencing critics and doubters, with Owen Farrell starring at both fly-half and inside centre. Stuart Hogg and Jonathan Davies failed Head Injury Assessments (HIAs) for the Lions, with Gatland admitting both backs now face a race against time to be ready to take on the Maori All Blacks. Captain Sam Warburton has been carrying an ankle issue but Gatland said the Wales flanker should be ready to face the Highlanders on Tuesday night. “Stuart Hogg’s got quite a nasty bruise on his eye and cut there, and both he and Jonathan failed HIAs,” said Gatland. “So it’s going to be six days for the return to play for them. “And they’ll just go through the protocols. “Stuart had been training well, we were trying to get the ball in his hands. “For that to happen, he’s caught Conor Murray’s elbow, that was a bit unlucky in that situation. “And he was looking dangerous, on outside breaks and things. “So we’ll hope he can be back for the Maori game next week. “It’s just a question now of how much training we can get under their belt, because they will have to stay away from contact. “We’ll play that by ear and see how it goes. 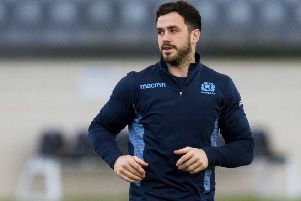 “We will probably give Sam (Warburton) a run on Tuesday. He needs some game time as well.